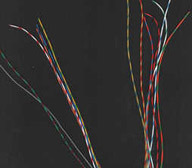 Equipment wire is insulated with PVC and can be colour coded to your requirement. We also provide stripe colour coding (as shown below). We can manufacture any individual requirement that is necessary for you. Please contact us for further details.